Following a highly successful coaching tenure at Oregon’s Lake Oswego High School, Laura Caldwell joined her husband on the staff at Furman University in 2010. The former 800m school record holder at Florida State quickly made her presence a positive experience for the Paladins. In only two years, she led the women's XC team from sixth place in the Southern Conference to a top ten ranking in the Southeast Region and a surprising second place finish at the 2011 SoCon XC championships. She coached her student-athletes to one SoCon individual championship (10,000) , two runner-up finishes (10,000 and Steeplechase) and a third place finish in the Indoor Mile. Four of her XC athletes earned All SoCon honors, one All-Southeast Region, and three all conference honors in Indoor/Outdoor track. She also had six All SoCon Freshmen performers. In the 2012 season her athletes broke school records in the Mile and 3,000 Indoor and the 1500, Steeplechase and 5,000 meters Outdoor. Caldwell's coaching success has continued at the post-collegiate level with ASICS GTC-ELITE. The women finished 8th at the 2015 USA Club Cross Country Championships, in their first year competing as a team, placing two among the top 27. 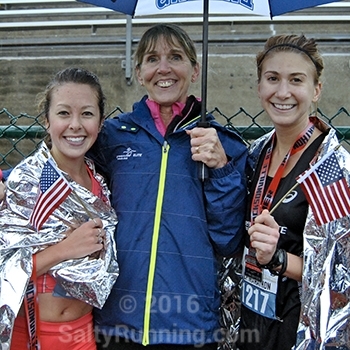 Then, in early 2016, two of the women she coaches (Dylan Hassett and Nicole DiMercurio) ran under the standard of 1:15:00 in the Jax Bank Half Marathon to qualify for the 2016 USA Olympic Team Marathon Trails in Los Angeles. After graduating from Florida State with both a bachelor’s and master’s degree, Caldwell excelled as a professional distance runner, winning the Racing South road racing Grand Prix series four times, the Dallas Grand Prix, qualifying for the US Olympic Marathon Trials twice, and winning US National Masters championships at 5,000m and the Half Marathon. She competed as a NIKE sponsored athlete. Among her many accomplishments, she placed among the top ten at Atlanta’s famous Peachtree Road Race three times (including a runner-up and one third place finish), placed 8th in the 1987 USA Women's Marathon championships, won the 1992 Seattle Marathon, won USA Masters 5,000 championship on the track and was the '93 USA Masters Cross Country champion. She also earned three silver medals at the World Masters Games in 1997 (1500m and 5000m on the track and over 8K cross country). She competed for the Bowerman Athletic Club, which won the USA National Masters XC Championship. Laura demonstrated tremendous range in competing at a very high level from 800 meters (former school record at Florida State) up to the marathon. One of the highlights of her career was running 1:15:52 for the half-marathon at age 43. At Lake Oswego High School, Caldwell’s girls’ cross country teams qualified annually for the Oregon 6A State meet and reached the podium in 2007. Regarding individual athletes, she coached runners who were selected to the compete in the prestigious Nike BorderClash between Oregon and Washington. She also coached the state runnerup in the 1500m (2009) and 3000m (2009 and 2010) and led the Lakers to a sub 9:40 clocking in the 4x800m. Her former athletes went on to compete collegiately at such highly respected programs as Stanford University, Oregon State, Pomona (a top DII program) and DIII powerhouse WiIliams College.